Shelter Island limousine and Town car Services is available 24 hours a day, 365 days a year by ASM.You will speak with one of our highly trained company employees, not an answering service or tape machine. Our staff is there to handle any changes to your itinerary or to take reservations as needed. For your convenience, we have provided an online reservation form and online Quote for quick and easy contact with us. Safety, courtesy and professional chauffeurs are what our clients have come to expect, and that is what we have done for decades. If you need a sedan or if you must transport a large group, we can promptly provide clean and safe vehicles. Shelter island limousine, Town car and minivan service provides Airport pick ups and drop transportation service from or to Shelter Island. Vine Street Café Shelter Island NY. Memorial Day to Labor Day. Deck dining overlooking Shelter Island Bay. Open year round for dining, catering, and parties. Serving Italian and continental cuisine with indoor and outdoor dining. Closed Wednesdays. Our office is open Monday through Friday from 9 to 5 and Saturday from 9 to noon. Take Queens/Midtown tunnel. Take 495 east until to Exit 70. Turn right at "yield" sign to Route 27 east. Continue on 27 through the town of Bridgehampton. 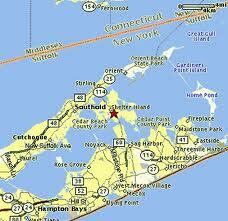 At traffic light, turn left onto County Road 79 through Sag Harbor (4 miles) to Stop sign at flag pole. Go left over bridge on 114 north for 3 miles to the South Ferry. Take 495 East to Exit 70. Turn right at "yield" sign to Route 27 east. Continue on 27 through the town of Bridgehampton. At traffic light, turn left onto County Road 79 to Sag Harbor. Take 79 through Sag Harbor to stop sign at flag pole. Go left over bridge on 114 for 3 miles to the South Ferry. Take 95 south to Exit 84 south to downtown New London Connecticut. At second light go left onto Gov. Winthrop Blvd. Cross railroad tracks and go right to the Cross Sound Ferry. Reservations are required and can be made at (860) 443-5281. Disembark at Orient Point. Take 25A west (9 miles) to the flashing light. Make a left at light and travel 1 mile to Greenport. At the next flashing light go right for 2 blocks to traffic light. Make a left at the light and travel for 1 block to ferry to Shelter Island. 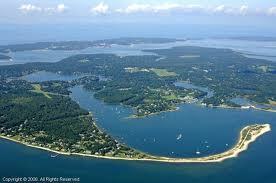 You will disembark on Shelter Island and onto Route 114 south. Continue on 114 south for 4.5 miles to the South Ferry. Take 87 south to Tappanzee Bridge. Stay on 87 until you reach 95 east. Stay on 95 east until you reach 295 south. Cross Throgs Neck Bridge. Take 495 east to exit 70. At exit 70 turn right at "yield" sign to route 27 east through town of Bridgehampton. Make a left onto County Road 79. Take 79 through Sag Harbor to stop sign at flag pole. Go left over bridge on 114 north for 3 miles to the South Ferry. Diningroom overlooking the bay; open during warm months. Year-round; closed Monday - Wednesday. Year-round fish market and dinners to go; outdoor summer dinner dining. A casual family oriented restaurant offering Spanish- Mediterrean cuisine, with tapas, free WiFi and entertainment for children. Open until 3 am. Continental dining. Lunch and dinner. Nearly year-round. Indoor and outdoor dining. Year-round. Shelter Island's "Inn for all Seasons" overlooking Coecle's Harbor. Our 55th year. Complete Deli, Gourmet Foods, Grocery, In-Store Bakery, Meats, Produce, Dairy, Frozen Foods. HOMETOWN PROUD IGA. A healthy foods market. In addition to groceries, smoothies, Free Trade coffee, a juice bar, and sandwiches. 44A North Ferry Road (next to Roy Reeve Insurance). Open 8:30 am to 5:30 pm. Closed Thursdays. Gourmet Take-out and catering. Rich and Rachel Fraser. 35 South Ferry Road, OPEN LATE for your conveinece - located on the way to South Ferry - Stop in for Hot Coffee, fresh pastries, bagels, groceries, cigarettes, ICE COLD beer & soda, milk, bread, sandwiches, snacks galore. Beach and fishing items too!! Adding new items all the time!! (631) 749-3500. 25 West Neck Road. Open daily. An old fashioned German style delicatessen. Homemade salads, hot and cold sandwiches, Boars Head cold cuts, cold beer, soda, ice, cigarettes, dairy, bread, groceries, coffee, tea to go. In the Center. Deli and market. Butcher. Open daily 6 am to 3 pm, except Wednesday Handicapped accessible. Dinner, Thursday through Saturday. The Coffee Cellar opens at 5:15 am. The Market Cafe, a deli with seating indoors and out, is open for lunch and takeout. Year-round fish market. Fish, lobsters, clams daily. Dinner, nearly year-round. Open daily for lunch and dinner, year-round. Lunch and dinner, warm months. Indoor and deck dining. Bar year-round. Copyright 2009 Limousine and Town Car Services NYC, JFK,LGA,ISP,EWR,HPN Airports. All rights reserved.